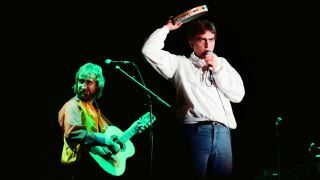 Genesis guitarist Mike Rutherford admits the band regrets not filming their 1982 reunion show with Peter Gabriel. The Six Of The Best concert in Milton Keynes came about after former frontman Gabriel needed help in paying off debts accrued by the financial failure of his Womad festival. Rutherford tells Rolling Stone: “We did it on my birthday. I mainly remember the incredible mud and rain. The guitarist has similar feelings about the band’s 1974-75 tour, on which they played The Lamb Lies Down On Broadway in full at each show. Rutherford says: “When it worked it was really good. There were nights when not everything worked, but the energy carried it through.